Last Updated: 11/22/2012 | File Size: 12100 KB | Price: $49.95 | Downloads: 144 | Developer: DVDSmith Inc.
Any DVD Cloner Platinum is an ultimate DVD solution for copying DVD and ripping DVD. As a DVD copier, Any DVD Cloner Platinum can copy DVD movie to DVD and copy DVD to hard drive with 1:1 ratio in a super high DVD copy speed, shrink DVD9 to DVD5 with best quality, copy DVD to hard drive as DVD folder or ISO image file. As a DVD ripper, Any DVD Cloner Platinum can rip DVD to M4V, MP4, AVI, OGM and MKV. Any DVD Cloner Platinum also rips DVD to video formats playable on iPod, iPhone, PS3, PSP and Xbox360 so that you can watch your favorite DVD movie on the go! Coming with 4 DVD copy modes, Any DVD Cloner Platinum helps you to backup any DVD in an easy and flexible way. Full Disc mode helps to copy entire DVD to DVD or hard drive in exact 1:1 ratio, or shrink entire DVD9 to DVD5 without decreasing any files. Main Movie mode helps to copy or shrink the longest title, the main part of the movie to DVD or hard drive. 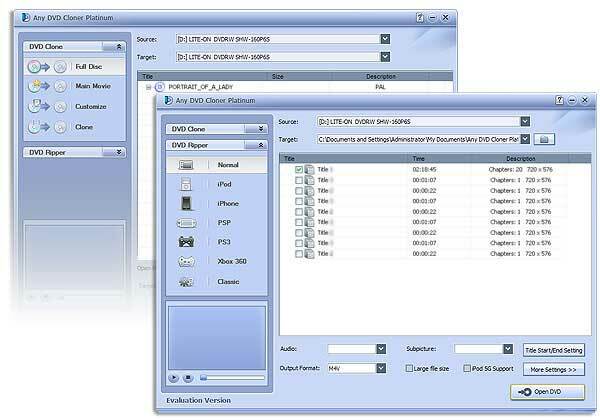 Customize mode lets you select any favorite title, chapter, language, subtitle to copy. Clone mode helps you to clone DVD to DVD in 1:1 ration without losing any video quality and decreasing any files. DVD ripping with interal DVD decryption is another attractive feature. Any DVD Cloner Platinum removes various DVD copy protection and rips DVD to videos at the same time so that you don't have to rip a copy protected DVD movie in a regular way which costs much more time. The convenient settings allow you to choose any title, chapter, language and subtitle to rip, set target video size, framerate, video/audio bitrate and audio mixdown including stereo, Dolby surround, Dolby Logic Pro II, etc. With this perfect DVD copying and DVD ripping combination, there won't be scratched or damaged DVD any more and you can enjoy any DVD movie anywhere at any time. Statement: First, please download the orginal installation package by clicking the download link. Of course you may also download it from the publisher's website. Using Any DVD Cloner Platinum for Mac crack, key, patch, serial number, registration code, keygen is illegal. The download file hosted at publisher website. We do not provide any download link points to Rapidshare, Hotfile, Depositfiles, Mediafire, Filefactory, etc. or obtained from file sharing programs such as Limewire, Kazaa, Imesh, Ares, BearShare, BitTorrent, WinMX etc. Software piracy is theft. If you like Any DVD Cloner Platinum for Mac please buy it.